It's hard to give this work a negative review, because it's a decent effort. However despite it's size, it's too short :) The info seems to reflect the editor's Eurocentric point of view: there is decent coverage of World Cup and Euro events. Latin American coverage is very weak, and Asian/African virtually non-existant. Also, it seems a bit too heavy on the very recent past. While this is understandable, it also can be annoying at times. For example, under "Great Players", most current decent players are covered, but many older ones omitted. And there are some glaring screwups: Jordi Cruyff, who hasn't done much, gets a writeup, but Berti Vogts, one of Germany's best ever defenders, capped 96 times, World Champ, etc. is only mentioned as a coach. Another insult is the inclusion of many crap American "stars". OK to include them, but until you've entered in the tons of real decent players from other eras, let's not waste the space. I'm sure you could find plenty of other glaring faults. 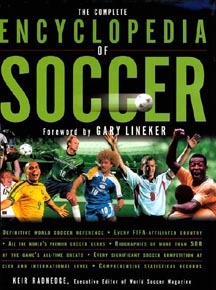 But rather than harp on all the problems, I will say that it's a useful addition to a soccer fan's library. The strengths outweigh the weaknesses.